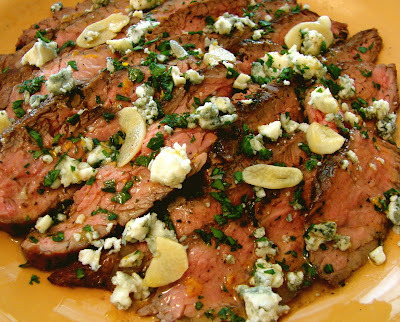 This video recipe for Flank Steak with Cabrales Cheese, reminds me of my theory that American's fondness for blue cheese as a garnish for burgers, steak, and other foods, can be traced all the way back to the Buffalo chicken wing. Now, I've done no research, nor will I, as I find it easier to simply guess about these kind of things, but think about it - who was crumbling blue cheese on their hamburgers before the chicken wing made it socially acceptable to eat our traditional meats and poultry with this funky addition? 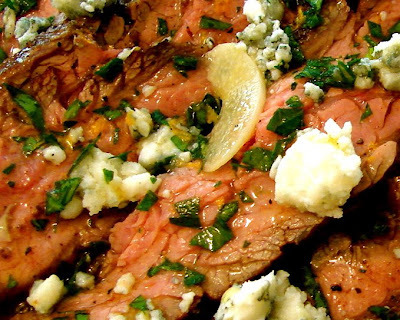 This delicious incarnation features juicy flank steak topped with Spain's famous Cabrales blue cheese. This flank steak recipe is simple to make, and even if your grilling days are over this season, you can pan sear or use a grill pan inside to make this dish. Enjoy! I wanted to give equal time, so it wouldn't look like I was officially endorsing someone. For some reason there were much better McCain pumpkin carvings, than Obama on Flickr (at least the ones I could use), so don't take that as any kind of media bias. While my preference will be kept to myself, I hope you all vote. 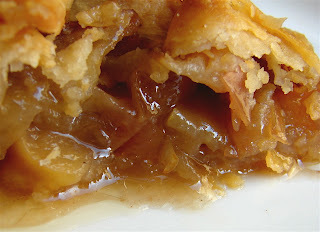 This photo is from a video recipe that will premiere tomorrow. Hint: It's not vegan. 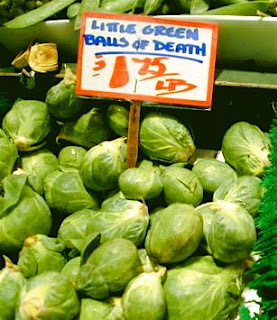 A fan of the site, Balu, sent in this great photo of the poor, misunderstood Brussel sprouts, and asked if I had a video recipe for this "interesting vegetable" as it was described in the email. Well, yes I do; 60-Second Brussel Sprouts! 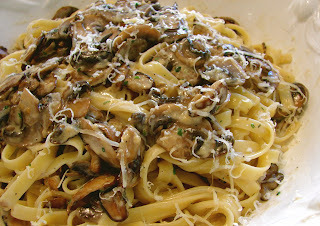 Believe it or not, this video recipe came up during the About.com meetings in Las Vegas. My friends and bosses, the lovely and talented Bonnie and Gina, told me that this was the most popular recipe I' ve done for them (and I've done a lot). They're both big fans of the veggie now, and regularly forward the recipe to friends. Yes, Brussel sprouts, who knew? You will see these all over the produce department this time of year, and in my humble opinion this 60-Second Brussel Sprouts recipe best shows off their sweet, delicate flavor. Enjoy! I'm sorry to disappoint those of you hoping this sandwich was conceived during some late night drunken gambling binge, but the truth is it was a premeditated event done in the middle of the afternoon, after drinking zero beers. I'm no safety expert, but a sleep-deprived drunk wielding a red-hot iron is a hard-to-explain trip to the emergency room waiting to happen. The reason late night hotel food is overpriced and of questionable quality is the simple fact that you are a captive clientele. 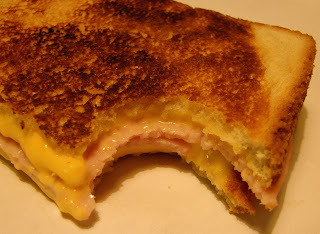 If you want a grilled ham and cheese at 2AM, you're going to pay dearly for it - probably twice. 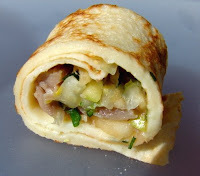 Besides, this is fun to do, and even though you can only make one at a time, they do cook quickly. Enjoy! This stunning specimen of a grilled sandwich was created with scavenged ingredients found in the hotel, and was cooked in my room without the benefit of a kitchen. My hotel is in downtown Las Vegas, on Fremont Street, which many claim to be the four most photographed blocks in the world. The entire street is covered with a television canopy, five football fields long, which bombards the revelers below with an music-synched visual display - think Lasarium on acid. This part of town is euphemistically called "vintage Vegas" and claims to be the "real" Las Vegas." Nothing says vintage like the world's biggest TV screen. All I can say is that I'm never staying in fake Vegas again. Viva, vintage Las Vegas! This was just a quick video I threw together to give you an idea of my base of operations. I didn't have time to edit a voice-over, so George Thorogood (misspelled in the clip!) stepped in. I thought it was just another one of those Las Vegas urban legends, like "loose" slot machines, and "no cover" gentlemens clubs. 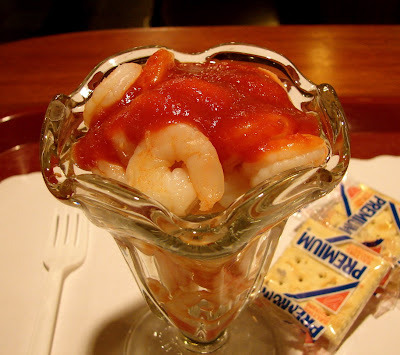 I'm talking about the mythical $1.99 shrimp cocktail. Well, it's true, and I have the leftover saltine crackers to prove it. 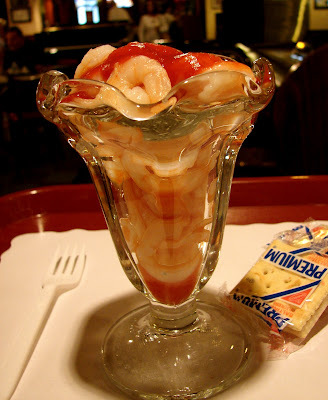 More about this culinary oddity in the feature film to follow. I've arrived safe and sound after a short, uneventful flight from San Francisco. I almost won the airport shuttle drop-off challenge, which is a little reverse psychology game I play coming from the airport. There were 14 people on my shuttle, all going to different hotels, and I pretend I win a huge cash prize if I'm the last one dropped off. But, it wasn't meant to be, as I was dropped off second to last. They never remember who finishes second in the imaginary airport shuttle drop-off challe nge. Here you can see my "please don't turn on that black light!" hotel room. It's actually looks very nice and clean (in natural light), and for the price of an all-you-can-eat buffet, I can’t complain. You can also see the lovely view from my hotel window. When they say "off the strip" they really mean it. Stay tuned! Ask someone from Mexico or Central America about homemade tamales, and you will see love in his or her eyes. Ask them about the all-American tamale pie, and you'll see contempt. Real tamales take hours of careful preparation, using secret formulas perfected over generations. They are more ritual than recipe. This video recipe for hot tamale pie is further proof that we Americans can take any sacred ethnic recipe, and turn it into a quick and easy casserole. 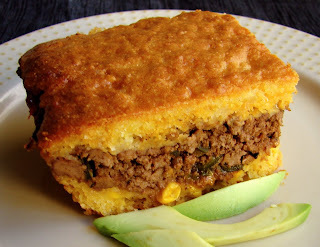 While this tamale pie has very little to do with its south-of-the-border namesake, it's a really delicious recipe all the same. So, with apologies to real tamale makers everywhere, I hope you give this a try. Enjoy! 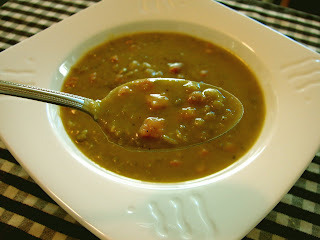 I can't remember the last time I made ham and split pea soup. It's probably been 10 years, which is remarkable since it's my favorite cool weather soup. I just don’t understand why I haven’t made it in so long. 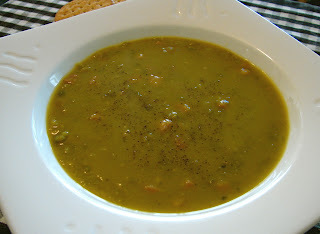 I've made bean soup, lentil soup, rice soup, and potato soup dozens of times each over the last decade, but not split pea. I've had leftover ham around countless times. I've ordered it in restaurants, so it's not like I forgot it existed. I'm sure I've even warmed up a can or two of Progresso at home, but making a batch never crossed my mind. It's a soup mystery that now consumes me; which is very ironic if you think about it. Anyway, the important thing is that I made it, and it was everything I remembered homemade ham and split pea to be - a hearty, soul-warming bowl of dull green brilliance. No matter how often you make it, this has to be on everyone's top 10 soups of all-time list. Enjoy! I'm About to Make Like a Pea, and Split… To Vegas Baby! 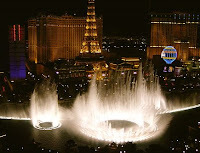 I'm feverishly working to wrap things up before I travel to Las Vegas on Thursday for an About.com guide event. They used to call these things "conventions," but when that term became associated with drunken debauchery, they started using euphemisms like, "Team Building," "Corporate Retreat," and "Company Conference." Also, they're not strippers, they are exotic dancers. As usual, I will try to photo, film, and write about my adventures for the blog. The beautiful Bellagio hotel pictured here is where I will NOT be staying. I was given a tip to check out some hotels off the strip, which, due to the current economic conditions, were offering some amazing bargains. I found a room for 5 days that is going to cost less...in total...than 1/2 a room for one night at the Bellagio! I will withhold the name of this high-end establishment until I see it firsthand. Wish me luck. 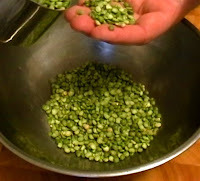 Speaking of Split Peas - I will be uploading a killer Split Pea Soup video recipe. I made it last night, and it was super good. Stay tuned! The Iranians Have Crossed the Line and Must Be Stopped! All this talk recently about possible military actions against Iran has been very troubling. I hoped our recent history had served as an important reminder of the benefits of diligent and effective diplomacy. But, recent events in Tehran have changed my attitude, and I think we may need to respond with force. What has me all worked up? Iran is trying to set the world record for longest sandwich! A team of chefs in Tehran, mostly women forced to cover their hair, and not for sanitation reasons, have reportedly built the world's longest ostrich sandwich. You can watch the report below. This is an outrage, and I will not bury my head in the sand, and pretend this affront to our entire culinary identity didn't happen. Sorry Iran, but long sandwiches, and other grossly oversized fast food is our thing. Luckily, the hungry crowd attacked the sandwich and ate it before its length could be officially recorded (true) - like an episode from whatever the Iranian equivalent of the Simpsons is. You know, maybe we are not so different after all. 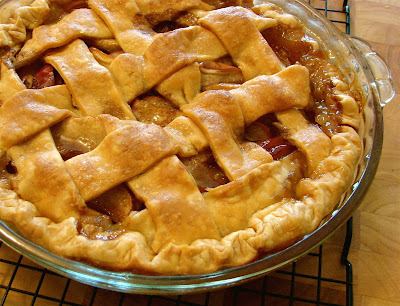 I am still working on a name for this video recipe as the title sounds a little too desserty. If you have any ideas, feel free to comment. I usually like to include the main ingredients in the name, but maybe in this case I should have just gone with "JJ's Magic Meatloaf," or "Mitz-a-loaf." I had some leftover buttermilk in the fridge and I wondered what would happen if used it to replaced the milk in my meatloaf recipe. I know you've read my various posts on buttermilk's delicious, tenderizing effects on meat, so at least my idea had some proven food science behind it. So, I decided to go for it, and was very happy with the results. 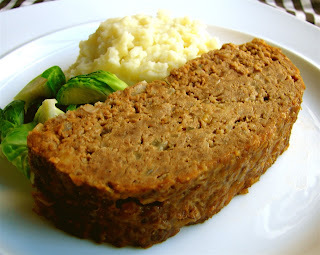 This meatloaf recipe is very flavorful, and as the proverbial description goes, "melts in your mouth." As far as vegetables, I only used onions, but their sweetness, along with the simple brown sugar glaze were a great counterpoint to the others flavors. Even if you don't use this exact recipe, you should try your own famous meatloaf recipe with buttermilk. Its effects were subtle, but noticeable. Enjoy! 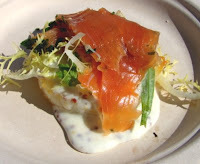 This past weekend I attended San Francisco magazine’s annual epicurean event, FallFest '08, which benefits the fine folks at Meals On Wheels. 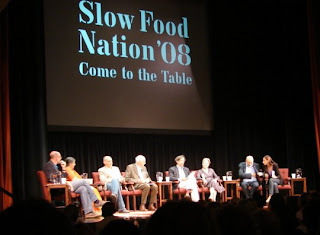 I was covering the event for Foodbuzz, and even though I was given a ticket, I was determined to post an objective, unbiased report. The challenge is if I'm eating free food, and drinking free wine, I tend to praise it more than if I was paying for it. Being a food blogger, I'm bound by no moral or ethical standards for objectivity. With that disclaimer out of the way, I was very impressed with what San Francisco magazine managed to pull off. Organizing 43 restaurants, paired with 43 wineries, along with chef demonstrations, and live music, is no mean feat. By the way, whoever was in charge of weather should get a raise. It was the most beautiful fall day imaginable - clear blue skies, brilliant sun blazing at that lazy, low autumn angle, and a cool breeze too perfect to describe. The event was held at Justin Herman Plaza, near San Francisco’s Waterfront, in the shadow of the Ferry Building. 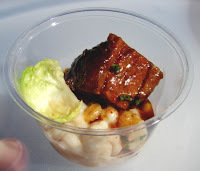 On entering the event, I received an opaque oval plate for my food, and a sparkling new Riedel wine glass. Equipped, I turned on my camera, and proceeded to graze my way across the grounds. The food highlights, some of which are pictured here, will be explained in the video clip below. As far as the wine, I only had two glasses, so I can’t really comment other than to say the vinophiles in attendance seemed very impressed. I noticed something odd, especially for events like this, it was crowded, but there were no lines. There was plenty of room to move around, yet it felt cozy and intimate. There were two disappointments. First, the official water for this fine event was not delicious San Francisco tap water, but bottled Fuji water. I'm no geography expert, but Fuji is so not local. I will assume since this was a benefit for Meals On Wheels, that Fuji kicked in some cash to be involved, but I would have left the info regarding how "green" their water is back on the island. 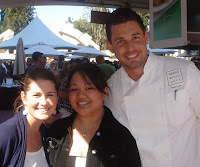 The second, and most disappointing, was the presence of Top Chef contestant, and fledgling San Francisco celebrity chef, Ryan Scott from the Mission Beach Café. When I saw him, and his full head of thick hair, I was so excited, as I figured I could do a whole blog post ripping him and his food. I would expose him as the overrated, untalented, reality show pretty boy, he must so obviously be. But, then I met him. Much to my chagrin, he was very nice, extremely courteous, and happily chatted up the guests. He even graciously posed for pictures with lots of ladies, and a few well-groomed men. Even worse, he can cook! 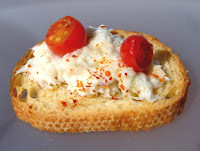 His pork and white bean crostini was to-die-for, and in an informal poll I took, was voted to be the outstanding bite of the day. Congratulations Ryan, and thanks for nothing. In conclusion, I will say in all honesty, I'll definitely be attending FallFest '09, even if I have to pay for my own ticket. Coming from a media freeloader such as myself, there is no better recommendation. Enjoy the video slide show! Last week, while looking at my traffic stats, I noticed an unusually large number of visitors from Singapore. I followed the trail to a blog called Xiaxue, which had linked to my chocolate lava cake video. As I read the post, I was shocked to see the blog's author, Xiaxue, had sent me a comment, but that I never replied! Even worse, I noticed the website had received numerous awards as Asia's top blog, and that Xiaxue was a bona fide Internet superstar. As you know, I religiously answer every single comment and email I get (except for the ones I don’t), so I quickly emailed her to find out about her ignored comment. She quickly replied and said she wrote this long teary comment about how my recipe had aided in her quest to get hitched, and she told me to keep on blogging. I was so excited to get an email from such an important person for a change, instead of the usual stuff I get from you people. I thanked her, and offered to film any recipe she wanted. 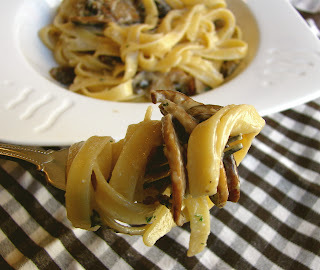 She asked for creamy mushroom pasta that she gets out, but wants to make at home. So, this video recipe was her food wish. I watched a couple of her videos and learned that she likes to be called Yan Yan, which explains the recipe's name. By the way, she said that Xiaxue is almost impossible to pronounce if you're not Chinese - which I took as a challenge, and as you'll hear in the clip, I try on several occasions. Enjoy! I’m very proud to announce the official launch of the Foodbuzz Publisher Community! For the past year, Foodbuzz has been deftly developing partnerships with food bloggers, and building their Featured Publisher program. Today, they made the announcement official, and I wanted to let all of you know, and to offer my hearty congratulations. As an active member of their Featured Publisher community, I have enjoyed watching their site explode with foodie content, and always find it a great source of inspiration. 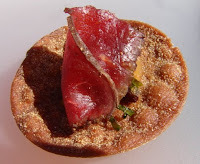 I just received the press release, and was thrilled that my "Found on Foodbuzz" 24-course meal was included! Foodbuzz is the only online community with content created exclusively by food bloggers and rated by foodies. The site offers more than 20,000 pieces of new food and dining content weekly, including recipes, photos, blog posts, videos and restaurant reviews. Members decide the “tastiness” of each piece of content by voting and “buzz” the most popular posts to the top of the daily menu of submissions. 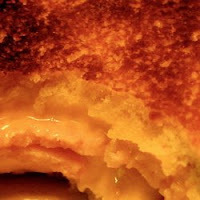 Foodbuzz currently logs over 13 million monthly page views and over three million monthly unique visitors. 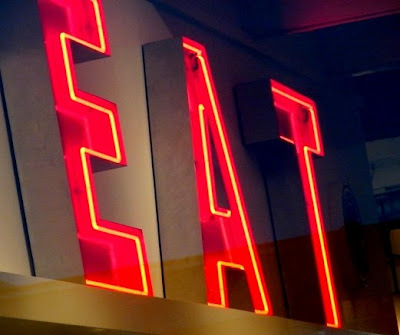 “Our goal is to be the number-one online source of quality food and dining content by promoting the talent, enthusiasm and knowledge of food bloggers around the globe,” said Ben Dehan, founder and CEO of Foodbuzz, Inc.
Tho X. Bui, Foodwish.com fan, and fashion icon, sent me this Youtube clip of, well, I'll let him explain, "…for the 2008 Tour de Fat (one less car!) parade, my friend Joe Strutmann and I rigged up my homebuilt tandem trike and turned it into a mobile grilling station. We served two-dozen burgers and collected a little bit of money for the UMOM's New Day Family Shelter (shelter for homeless families). A fantastic fun time. I'm wearing my awesome "A Hollandaise Can Sense Fear" T-shirt from Foodwishes.com." He raised money for charity, and promoted my shirt! Well done! 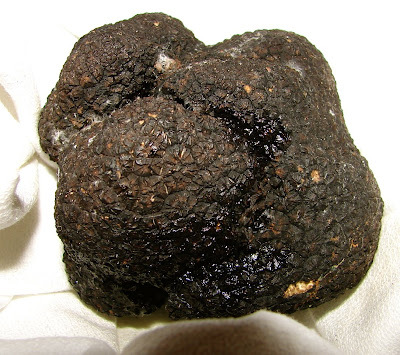 This tennis ball-sized black truffle was brought to our table last night so we could smell it and decide if, for $15 extra dollars, we wanted it shaved over one of our courses. We decided to just go with the free whiff. It was our 9th wedding anniversary (and 19th year of cohabitation), and we dined at La Folie, one of San Francisco's top French restaurants. We had a great time, and a great meal, and Chef Roland Passot even shaved some of the truffle over our scallop appetizer as an anniversary present! This very delicious salmon video recipe features a classic flavor profile from Southeast Asia - garlic, ginger, and basil - all playing together in a slightly sweet, slightly spicy sauce. 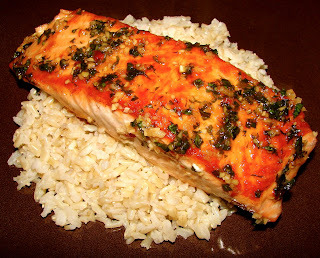 People are always looking for easy and quick salmon recipes, and this is both. 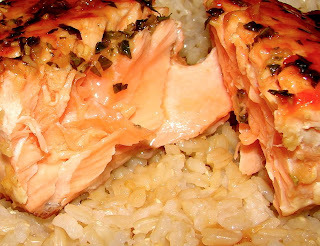 As an added bonus, the fragrant sauce will scent your kitchen with more than the smell of seared salmon. There really isn’t anything to not like about this recipe…unless you are a food stylist. I can't think of a harder recipe to make look great in a photo. The chopped basil turns dark green as soon as it hits the sauce, and against the coral fi sh, looks almost black. In fact, as I admit in the video, I almost skipped the basil knowing what dark horrors it would inflict on my beautiful sauce. Luckily, I didn’t succumb to such superficial concerns as the flavor the herb gives the salmon is critical. When cooking, the form verses function debate is always settled with a fork. 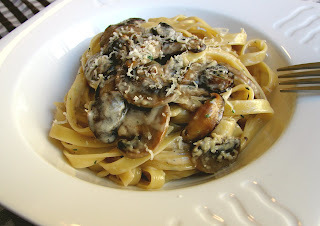 By the way, you can make three equally delicious versions of this by using cilantro, or mint, in place of the basil. Enjoy! 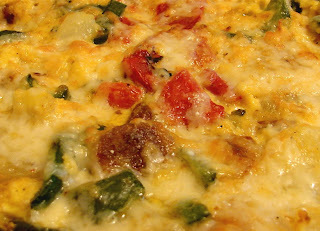 NEW and IMPROVED: Eggy Potato and Pepper Pie - Now with Scintillating Narration! By popular demand, here is a version with narration. I still wasn't in the mood, so I decided to try and have a little fun with it. By the way, it is very inspiring to know I can have a positive effect on some of you just by talking! Thanks! Aunt Mary's was a popular brunch restaurant here in San Francisco that served a wonderfully homey array of Mexican and Salvadorian dishes. Michele and I used to go every Sunday for a late breakfast (that's what brunch used to be called). She would always get the Huevos Rancheros, and my usual was the Pollo en Crema, which is the subject of today's video recipe. Sometimes it's fun to cook a recipe that ignores the standard techniques that usually rule the production of my food. This recipe is a simple boiled chicken - no browning, no deglazing, no reducing, and no layering of flavors. As you'll see, you just toss all the ingredients into a pot and simmer it until tender and delicious. My standard ethic recipe disclaimer applies; I'm not, nor have I ever been, Salvadorian. 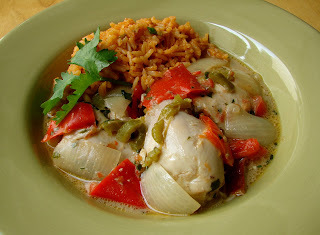 This is what I used to get at a restaurant that claimed to serve Salvadorian food, and they called it Pollo en Crema. I'm sure those of you in the know will point out if, and how, this varies from the "real" authentic recipe, but what I can tell everyone is that this simple pot of chicken is great food. Enjoy! There were a couple comments on the Beef Merlot recipe about using cauliflower, instead of potatoes, for a side dish. I remembered doing a mashed cauliflower video recipe a while ago, so I thought I would post it. When I went to grab it, I realized that it was actually mashed with potatoes, but it's better than nothing, so here you go. 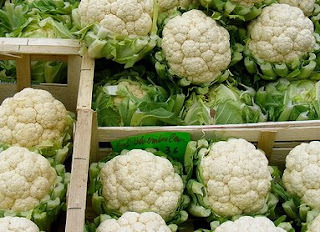 I've also posted my other cauliflower video recipes below. If you want to read the original post, click on the link provided. Warning, some are really old, and were filmed/ edited with my original equipment. Enjoy!